Influencer marketing has come of age. 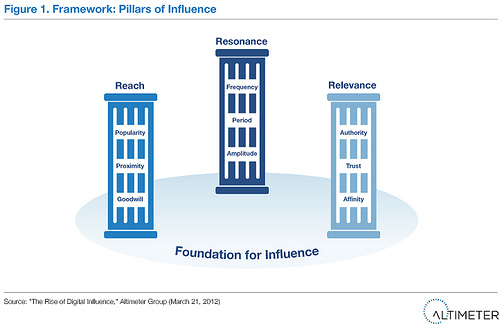 It was four years ago that Brian Solis, Principal Analyst of Altimeter Group, described reach, relevance and resonance as the pillars of influence in his first report for the research and strategy firm: the rise of digital influence and how to measure it. Yet today influencer marketing still lacks a framework; a methodology with which the discipline can consistently meet a firm’s business objectives. According to a survey by all-in-one brand newsroom and multimedia PR platform company Mynewsdesk, over half (56%) of marketing and communications professionals complain that they fail to achieve a positive result with their influencer marketing campaigns. 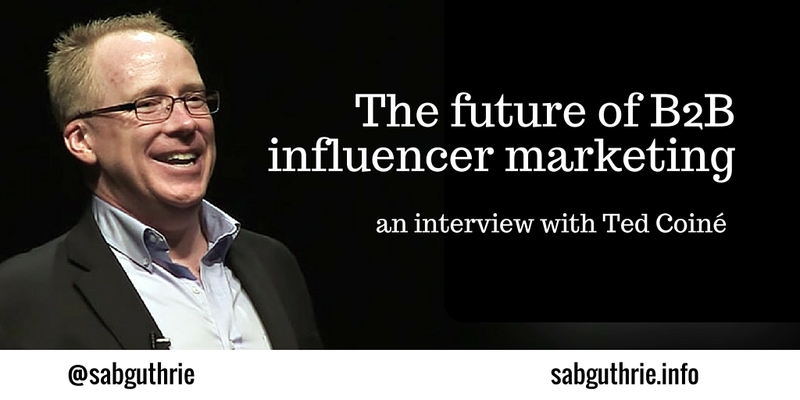 I asked Ted Coiné how influencer marketing will evolve in the near future. How he believes he can ‘fix’ the broken system of influencer marketing. Why brands should pay their influencers and where the mark in the sand lies between earned and paid-for influencer marketing. Ted is a Forbes Top 10 Social Media Power Influencer and an Inc. Top 100 Leadership Expert. With half-a-million followers on Twitter Ted is a heavy-hitter in terms of influencer reach. He’s ranked #1 authority on the Social CEO and #3 in the Future of Work affording him near-unparalleled relevance in his fields of expertise. He’s the co-author of A World Gone Social: How Companies Must Adapt to Survive – a book I’ve read a couple of times, returning to it regularly as a reference for how leadership is evolving in the Social Age. His work is shared and commented on widely earning him huge resonance. “ Influence will lead marketing efforts by 2020. Already, 84% of marketers and PR professionals globally plan to leverage influencers in 2016. It’s the most effective form of “advertising” there is, and when coupled with a solid content strategy, no TV or Facebook ad buy can even compare. “Across the board, brands will compensate influencers – it won’t even be a discussion point soon. After all, this isn’t 2010, when the industry was still new and most “influencers” had audiences of hundreds, not hundreds of thousands. Already, this tide has changed. As Jeff Bullas put it, at this point brands appear “arrogant and unprofessional” to even ask for free love from influencers. “Analytics tools keep improving, which means that measuring influencer performance, rather than just their activity, will become ever easier. This is great for the professionals among us who have built a loyal following. It’s really bad news for those who buy fake followers and merely appear influential. “Some agencies pay influencers, passing on that line-item from the brands they work with; we already have three of these lined up as channel partners. Some agencies neither pay influencers nor recommend the brands they work with do so. I’m confident these will either go out of business or change their practices, some as early as 2016. “As for the Extraordinary Influencer Network: The best way to think about us is as a solid cohort of B2B influencers – fifty thought leaders with an audience of over 5 million on Twitter alone, not to mention LinkedIn, podcasts, popular blogs, YouTube channels…. We have the ear of the enterprise executive, the decision-maker who IT vendors, for instance, value so much. “We’re authors, keynote speakers, and present and former C-level leaders. That’s without question the hardest group to gather, and these trusted thought-leaders are the hardest for agencies to attract or – more importantly – keep engaged for long. “I really love this question because it exposes the vast divide between brand and influencer perception. “What it boils down to is this: Brand representatives think more highly of the value they provide than we influencers do. The brand reps are immersed in all the amazing things their company is doing. Let’s face it, these are brand-enthusiasts who were selected to run influencer marketing efforts because they’ve drunk the Kool-Aid. That’s nothing but admirable, just to be clear. “But influencers aren’t professional brand-enthusiasts. They are not immersed in your culture daily. If your company is trying to redefine how enterprise cloud hosting is done, for instance, well… so are two dozen other enterprises like you, not to mention hundreds of startups. “Influencers – that is, real influencers, with well-established and loyal audiences that they’ve gathered by providing consistent value over the past four, five, six years online or more – they know they have what brands need. “There are a couple of parts to this question and so to my answer. The first: to make an influencer program successful, think of it as an ongoing mutual relationship, not merely a campaign. “Next, there’s what influencers find of value. If you’re a kid just out of college, a trip to a conference or to someplace exotic – wow, how cool is that? But few B2B decision-makers – the leaders a B2B brand is trying to reach – takes business advice from twenty-three-year-olds. “For actual B2B influencers? I don’t know one who finds offers of a free trip attractive. Most of us would rather be paid to stay home! After all, we travel to events for a living, many of us to give the keynote address. “As for social media promotion: that’s media, just like a TV, Facebook or YouTube ad buy, only studies show influencers are more effective. Thinking of it that way should clear the remaining misconceptions brands and agencies have on this topic. “Earned media is great – if your company does something remarkable and an influencer takes to social media to tell her followers and subscribers about it, you’ve struck marketing gold! But how does a brand control that? “Usually, moments of earned brand-love just happen, and often from unexpected quarters (and they happen much less often to B2B brands than B2C). Worse, how does a brand sustain that interest? A one-time blog post might happen, but then the influencer is on to the next topic, never to look back. “As I said, the only thing your brand has that an influencer needs is pay. Of course the brand must be admirable, or the influencer will burn the trust of her audience. Ted Coiné is CEO of The Extraordinary Influencer Network, a group that is rewriting all the rules of influencer marketing by cutting out middlemen to work directly with B2B and luxury brands. Proud “bleeding heart capitalists,” he and his team have built support of a great cause into every for-profit campaign they undertake. His entire career, Ted has collected fascinating people, most notably other thought leaders who also have a large and loyal audience of large enterprise leaders. He has watched the Wild West that is influencer marketing until he realized an opportunity to fix this broken system, and give influencers the sway they need to move markets together, and to get paid what they’re deserved for this power they bring to bear. An Inc. Top 100 Speaker and one of Business News Daily’s 15 Twitter Accounts Every Entrepreneur Should Follow, Ranked #1 authority on the Social CEO and #3 in the Future of Work, Ted is also a serial business founder and CEO. Ted is a Forbes Top 10 Social Media Power Influencer and an Inc. Top 100 Leadership Expert. This stance at the crossroads of social and leadership gave Ted a unique perspective to identify the demise of Industrial Age management and the birth of the Social Age. 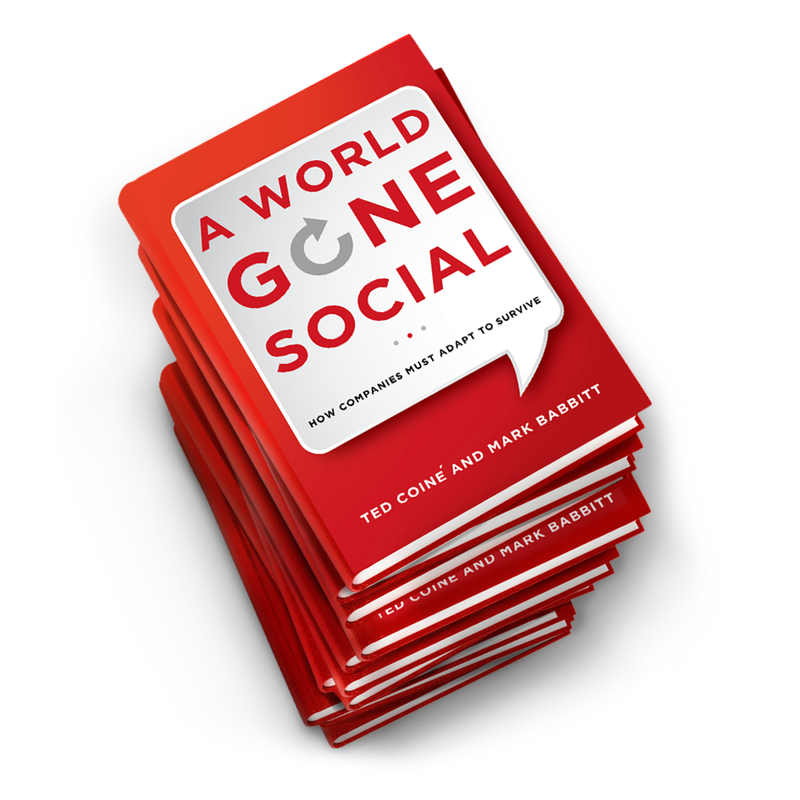 The result, after five years of trend watching, interviewing and intensive research, is his latest book, A World Gone Social: How Companies Must Adapt to Survive. He lives in Naples, Florida, with his wife and two daughters. (c) the audience does anything with the content you’re sharing. Does it RT, like or better still go to the source content and follow through on the CTA there. Great hearing from you Alex. HNY.